Summary The south side of childcare centre (kindergarten) in Nieuwland consists mainly of glass with a large overhang as a continuation of the flat roof in order to make optimal use of passive solar energy. 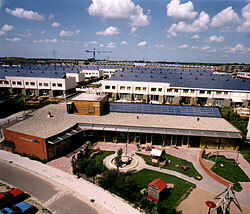 The building has been equipped with 73 m2 solar panels: 8 kWp in a tilted part (sawtooth) of the flat roof. The tilt angle is 20 degrees and the orientation of the solar panel is south. The ecologic building design has been made by BOOM-adiviseurs, located in Delft in the Netherlands. The yearly solar electricity output from the PV-system is expected to be 6500 kWh.